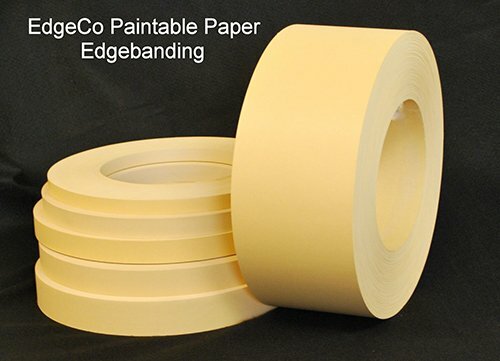 Paintable Edge Banding - EdgeCo, Inc.EdgeCo, Inc.
Resin saturated paper specially designed for painting available Pre-Glued & Automatic. Master Rolls available to be silt to custom widths. Paintable Edge Banding is available for same day shipping. More than 1800 PVC edge banding matches are in stock. All PVC edge banding matches are available with hot melt adhesive (Airbanding) for hot air edgebanders and peel and stick adhesive (EeeZeeEdge). EdgeCo maintains North America’s most comprehensive inventory of edgebanding that includes Wilsonart PVC edge banding, Peel and Stick – PSA edgetape, Iron On edgebanding, Wood Veneer edgebanding, melamine edgebanding, polyester edge banding, Acrylic edge banding, Metallic edgebanding, Hot Melt edgebander adhesives and Flexible Wood Veneer Sheets. See Match Look Up Tab for EdgeCo’s PVC edge banding Color Match-Look UP and find your match. All major brands including – Abet Edge Banding, Arpa Edge Banding, American Laminates Edge Banding, Arborite Edge Banding, Dixielam Edge Banding, Duramine Edge Banding, Arauco-Flakeboard Edge Banding, Formica Edge Banding, Funder Edge Banding Edge Banding, KML Edge Banding, Laminart, Nevamar Edge Banding, Panolam, Pionite Edge Banding, Pluswood Edge Banding, Premoule Edge Banding, Roseburg Edge Banding, Stevens Edge Banding, Tafisa, Uniboard Edge Banding and Wilson Art Edge Banding can be searched here. Over 1800 PVC Color Matching PVC is in stock for same day shipping. EdgeCo offers the most comprehensive inventory of PVC edgebanding matching all major brands to insure product availability. Custom services include: Custom color production runs of PVC, ABS, Custom Stained Wood Veneer edgebanding – slitting to custom sizes from master rolls – applying hot melt glue for forced hot air application – applying peel and stick PSA adhesives for an EeeZeeEdge application. “A Simple Solution that Really Sticks!” Formica Edge Banding production run quantities are available from .5mm – 3mm thick.